Various mediums have flooded people’s lives, in which digital data have transformed into an indispensable existence. However, in a parallel universe, exhibitions can be found. In this universe, artists are its programmers and symbols and meanings are used to create paths and scenes. Artworks no longer serve as finished products, but rather iterative methods that connect different moments. Here, the audience may use its senses to study exhibition text and artworks in order to create its own interpretations of the artworks or even co-create new artworks. On the basis of this premise, what perspectives should the audience adopt to identify the messages and inspirations that the Air Plant exhibition wishes to detail. In the nineteenth century, a British doctor by the name of Nathaniel Ward accidentally discovered some plants undergoing photosynthesis and forming their own circulation system and micro-ecology in an airtight glass container containing little soil and minimal water. The airtight container is known as the Wardian case, a container that had played a critical role in preserving and transporting plants. Although Wardian cases were merely glass containers, they had a remarkable influence on world history: Plant hunter Robert Fortune used them to transport tea plant seeds and seedlings from Anhui and the Wuyi Mountains to the Indian Himalayan region, which subsequently changed the scope of tea production in the region; and Clements Markham used them to transport cinchona trees (which can be used to extract and purify quinine) from South America to the U.K. as well as Kolkata, eliminating the suffering caused by malaria. These examples show how the seemingly insignificant glass containers slowly changed the world. Similar to the Wardian case, the Air Plant: Performance Ability within Contemporary Arts exhibition (hereafter referred to as the Air Plant exhibition), creates an environment that promises life, invites heterogeneous and diversified artworks, and opens new boundaries. In addition, the exhibition uses life to beget life, forming a universe that ventures into an unknown future. Air plant refers to the plant from the Bromeliaceae family that inspired Chun-Yi Chang, the curator of this exhibition, to organize the exhibition; the plant symbolizes free and active art creations which, combined with the concepts proposed by Nicolas Bourriaud (i.e., radicants, which possess roots that can grow in different directions, exemplifying the exploration and understanding of foreign space) and Gilles Deleuze (i.e., rhizomes, which can be connected to external objects to form new bonds, signifying open minds and unlimited possibilities), transform the exhibition into an “art-practicing field that gives birth to new artists,” provide artists with new creative space, expand their horizons, and offer them new methods and attitude to look at art. The Air Plant exhibition shows its confidence in the performance ability within contemporary arts; however, it does not feature a prearranged theme and format, but rather combines the different practical experiences of its artists. Through this process, different thoughts and creative ideas are incorporated to inspire art performance-related imaginations. This approach echoes a statement made by Jorge Luis Borges, which is “Sometimes, clumsy metaphors and obvious attempts to beat around the bush are the most effective way to introduce puzzles.” Although the philosophy of air plant does not show itself in the artworks, it is filled throughout the exhibition sites. The artists learn that exhibitions should not merely conform to art traditions or seek to discuss various issues; instead, they should remind artists to utilize their encounters with other artists and refer to their own transformations as well as those of other artists to provoke new thinking logic and narrative patterns as they explore the unknown. One of the features of the Air Plant exhibition is that it is a location where people meet. Nicolas Bourriaud once said that art entails a state of meeting (état de rencontre) that facilitates interaction, in which artworks no longer travel through reading space (espace à parcourir); instead, they become experiences and perceptions (durée à éprouver). In other words, artworks and exhibitions are no longer production objects, but rather creations that induce communication and exchanges. 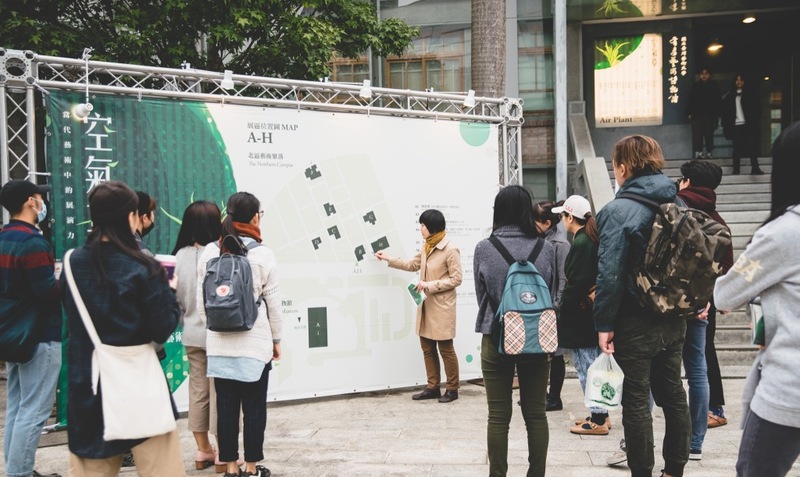 The Air Plant exhibition introduces two types of exhibition sites, where one possesses winding, maze-like qualities, and the other possesses clear traffic flow with complex meanings. The two types of exhibition sites give the exhibition a deep and diversified sense of space and time and a real and dream-like atmosphere (created by the artists’ intervention). In addition, the interaction between the audience and the artworks form special bonds. All regions create memories, feature various landscapes, and possess things that connect their local people together. These things may be people, objects, events, and sceneries. However, even for people who live in the same regions, they may have their own unique memories and landscapes as well as things that are of particular importance to them but not to others. By intervening, artists become catalysts that refresh people’s memories, capture the traces that have been left behind, uncover hidden psychological secrets, and construct unique narratives that may or may not be related to people’s local memories. The audience is invited to examine artworks created and use its physical perceptions and social experiences to embrace the bonds or disconnections created by the artworks, explore dissimilar perspectives, and form new insights. 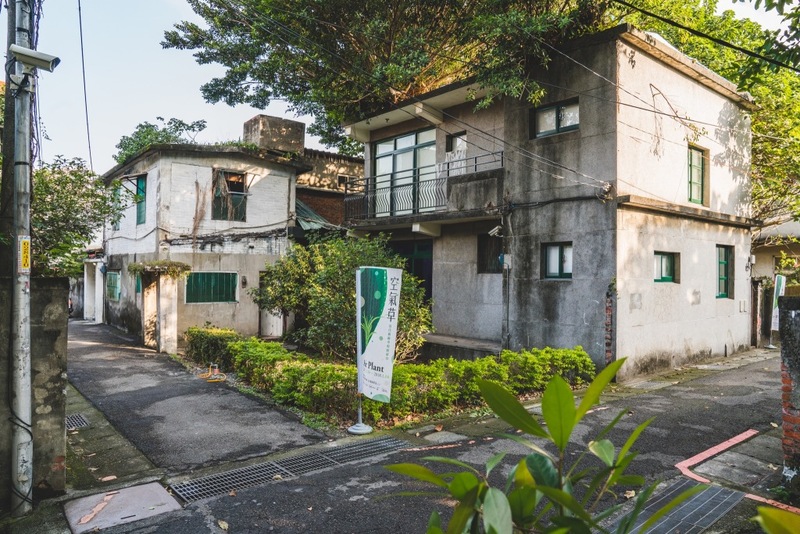 In The Northern Campus, traces of the past that remain in the old communes outline the living environment in the early days, allowing the audience to get a glimpse of the life stories of previous residents. The exhibition site today and the old communes in the past are like two parallel universes with meandering alleys. In addition, sounds of people and vehicles at a distance, the living environments of the communes today, and the communes serving as an exhibition venue form three intersecting worlds. Quiet forking streets allow the audience to travel through traces of history and witness stories that seem real and dream-like all at the same time. When artists of the Air Plant exhibition entered the old communes, they interacted with the physical and social spaces and created their artworks, marking the beginning of “encounters.” Later, the audience enters the exhibition, appreciates the artworks created, and develops an affection for the exhibition sites, marking the beginning of “relationships” (Picture 1). In Ying-Cheng Tsai’s No. 212 (Picture 2), community plants were used to create various artwork layers; the union of leaves on ceramic tiles, leaves floating on water, and grass, trees, and stones under the sky (which may be sunny or cloudy) paint a 3D landscape, showing the audience in the garden and by the pond how the pond and tiles transform into a stacked spatiotemporal space; Joyce Ho and Snow Huang’s 254 Yen uses documents, objects, and images left behind by an unknown visitor to uncover his identity as well as tell a fictional story that may or may not be the truth. The elements of reality and fiction, nerve-racking anticipation and suspense, and the audience’s perceptions and participation create different meanings and imaginations, where reality and memories engender a sense of on-site presence. Christo Jaracheff and Jeanne-Claude, a married couple, used wrapping to entice the audience to explore the true underneath the surface. In Yueh-Nu Kuo’s Layered Space, cortices and physical perceptions were used to decorate the internal and external spaces of a building and illustrate the internal and external parts of a body. Resins, peeled off surface layers, and the internal layers of building structure challenge the audience’s perceptions. 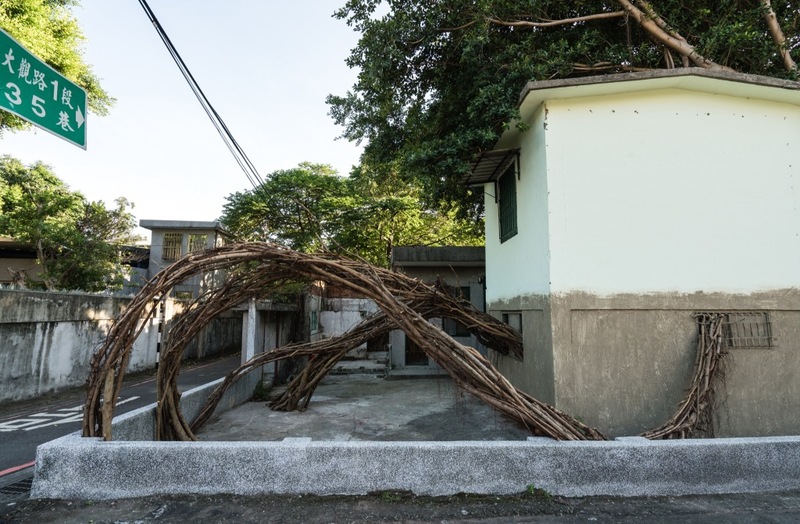 In Kuei-Chih Lee’s Recycling Scenery (Picture 3), tree trunks and branches showcase reality and imaginations, mud and sand build landscapes and memories, and tree roots climb and twine to break through walls and connect with the trees inside a house. Local materials were used to reproduce scenes of the past, and lights, shadows, and scents were used to put the audience in a time capsule to bring them back to the time when a flood struck and a time before certain landscapes were hidden, displaying the interaction between reality and fiction in a special environment. In Jui-Chien Hsu’s Direct, varying materials and trajectories are utilized to form a temporarily suspended space that emanates a strong sense of spatial existence. Seemingly stationary objects can be activated at a moment’s notice to manufacture a sense of tension of material movements. Various types of interaction and dynamic relationships exist between the objects and the space in which they are in. Audience entering the exhibition site sees not only to a sculpture area, but also a space where materials interact. In Shih-Chieh Lu’s Performer (Picture 4) and Order or Dance 2017, big walls of blue erase the complex histories of the commune space, opening a door to a new realm. The color of blue and physical movements are transformed into a virtual stage using digital algorithms. Here, the audience becomes also performers and explores the notions of space and perception. 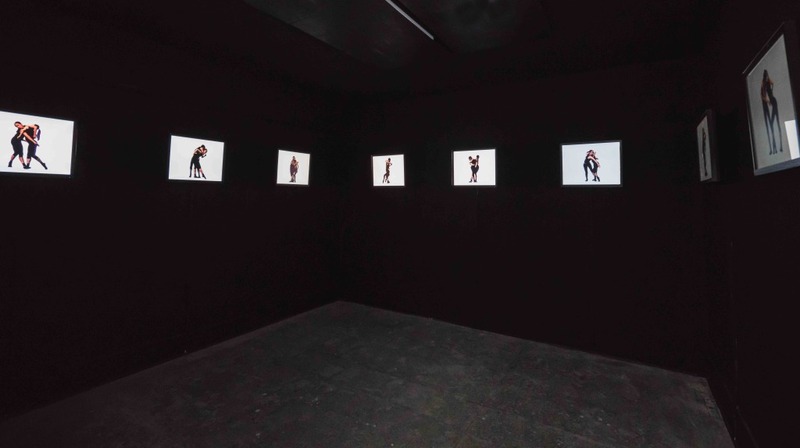 Joyce HO + Snow HUANG, 254 yen, 2017, Mixed-Media, Video Installation, Sound installation, dimensions variable. Human culture-centric exhibition sites demonstrate artists’ ideas, which break and turn the boundaries between artists and the audience, inspiring the latter. 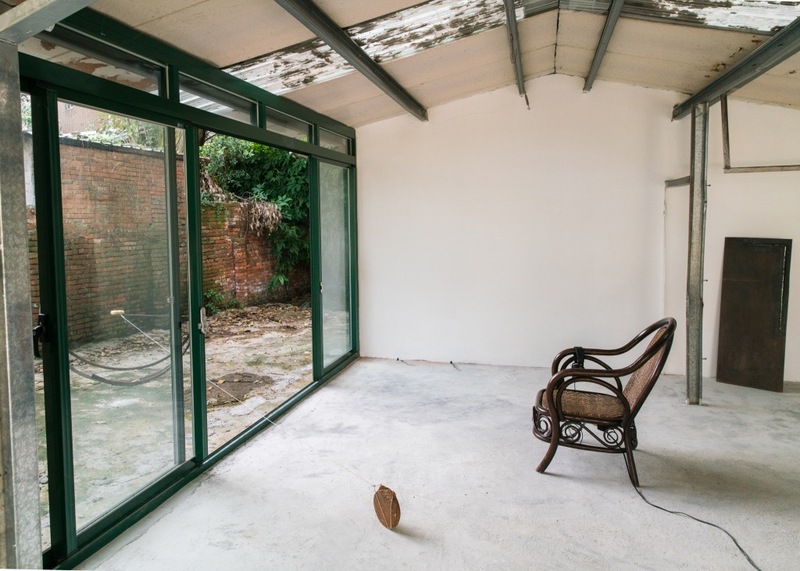 In, Yen-Hong Liu’s Ceylon Houndstongue and the Realms of Land, Water, Fire, Wind aznd Space, objects and paintings in a garden and rooms were used to create an everyday space where visitors talk about their dreams and the artist slowly and deliberately listen and paint the dreams. A “slow” and perception-oriented method is adopted for visitors to escape from time and logic. 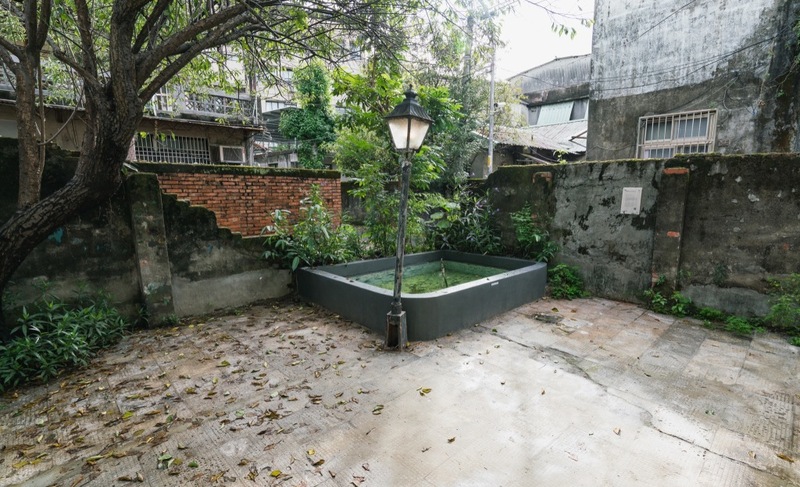 In Fong-Fong’s Group’s Fong-Fong House (Picture 5), human performances are incorporated into the artwork to create stories, where cracks and “sewing and mending” coexist together like sensitivity and rationality. Here, the audience observes the process of sewing and mending cracks, witness the revitalization of space, and use its bodies (together with those of the artists) to explore a new dimension of space. 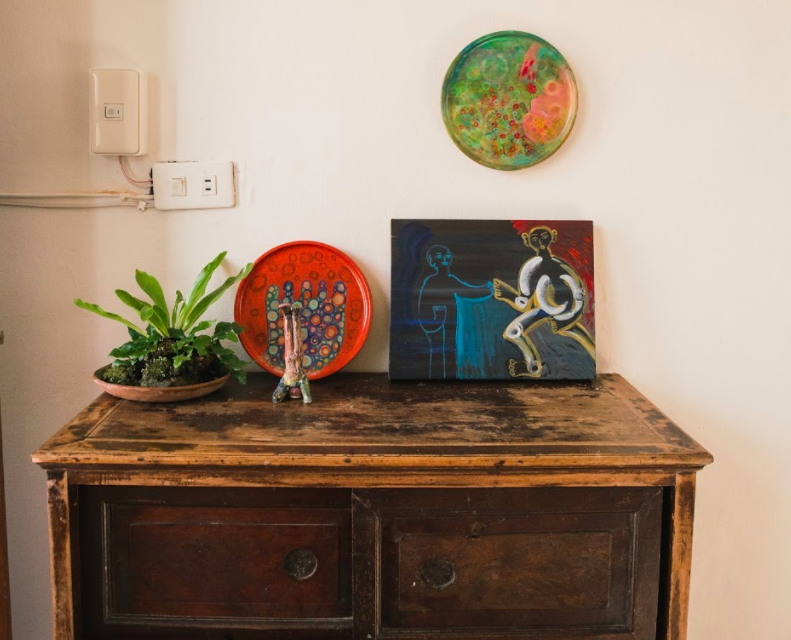 Artworks reconstruct the orderliness of space and accentuate the “contemporary qualities” of art villages. These contemporary qualities provide a platform for artists to build independent artworks that are connected with one another: In Yannick Dauby’s Trajectories & Impacts, four types of sounds are presented in an empty house, where the sounds are imaginations from a distant place and what the audience hears are perceptions right where they are. This phenomenon epitomizes the meeting between bodies and sounds, similar to Samuel Butler’s remark about the perception of time and space (i.e., “no-where” and “now-here”)_. In Wei-Chia Su’s FreeSteps – Sense of Place (Picture 6), slow and frozen images are used to display dancers’ movements, styles, and rhythms as well as music and lights. Bodies escape from culture and the need to survive as they become a medium of display and expand without limitations. As the audience moves from the exhibition site of Dauby to that of Su, it travels from a listening-oriented space to one that is body-oriented. 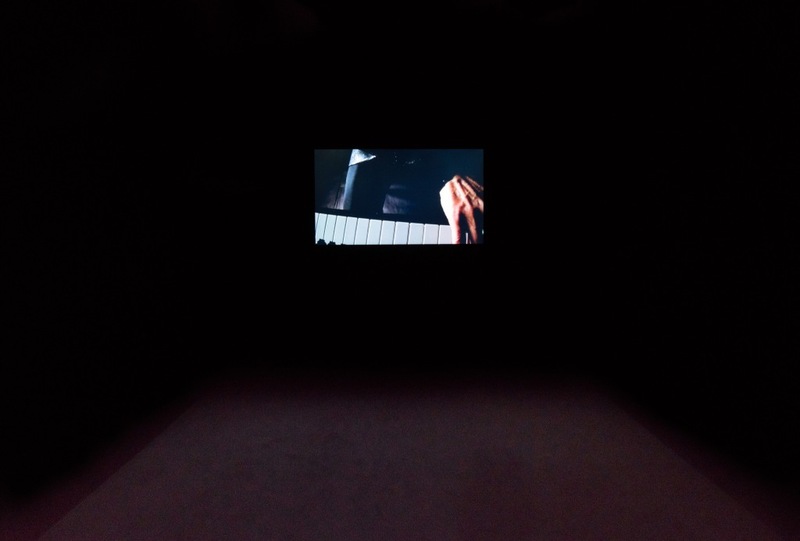 In addition, Jui-Chien Hsu’s Direct makes a cameo appearance, in which the devices (e.g., materials and audio devices) used by the three aforementioned exhibitions complement and expand one another. Although the three artworks can stand on their own, they are brought together to enhance the experience of the audience, in which videos, sounds, sculpture, and dances share an intricate relationship and form a dynamic path. 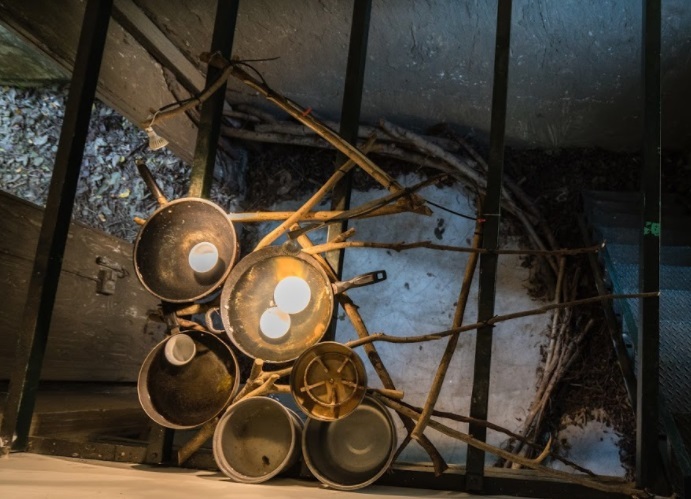 Kuei-Chih LEE, Recycling scenery, mixed materials (Nanzai Ditch mud, fans, projection lamps, tree branches, recycled living objects), installation, dimensions variable. Jui-Chien HSU, Direct, 2017, mixed materials ( Iron、plaster 、Elastic rope、 wood、 The Ready- made), dimensions variable. Shih-Chieh LU, Performer, 2017, photography lens, LCD TV, dimensions variable. If The Northern Campus is a space created using the properties of the exhibition sites and the artists’ artistic intervention, then the Yo-Chang Art Museum may be described as the disintegration and reassembly of exhibition sites. The combination of the white box and the black box produces a space filled with stories. In the museum’s theater space, materials become the primary performers and narrators, whereas actual performers (i.e., people) become mediums. Such an analogy is comparable to painting mediums used by artists in oil paintings that transform dynamic or static aggregations into flowing space. Yen-Hong LIU, Ceylon Houndstongue and the Realms of Land, Water, Fire, Wind, and Space, 2015-2017, video and spatial installation, painting (oil painting, watercolor, acrylic), sculpture (glazed pottery), dimensions variable. In this flowing space, differences and repeats are incorporated into time. In Joyce Ho’s These Things That Drift Away, three remarkably similar rooms with subtle differences are used to depict differences in people’s memories of waiting. The trajectories of time are hidden in the details, where the audience’s exploration endeavors fail to restore the truth of the story of waiting and inadvertently reveal the fictitiousness and diversity of memories. In addition, Vera Sung’s performance enhances the sense of imbalance in memories, in which the performance delineates alienation and bodies trapped in the distortion of time and space. 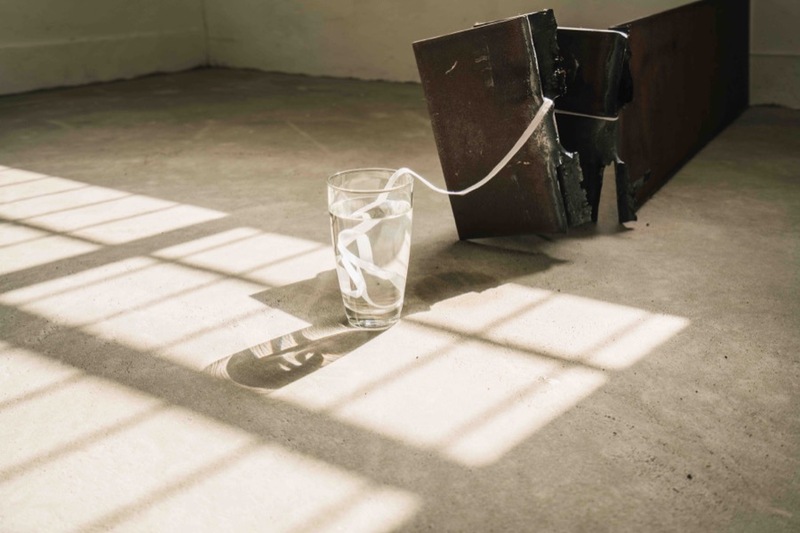 Beside Ho’s artwork is Yung-Ta Chang’s Relative Perception N°4−C, where liquids are used to convey the concept of time. Chang attempted to communicate with Ho’s artwork by introducing three thick metal plates that are intermittently corroded by cooper sulfate solution of varying concentrations. The repeated and varying interaction between the objects (i.e., metal plates and copper sulfate solution) and behavior (i.e., copper sulfate solution dripping) remind the audience of the perception of time, urging it to use its bodies to see, hear, smell, and feel time changes. River Lin’s A Day in the Life of the Administrator of Yo-Chang Art Museum showcases a parallel space featuring a daily real-life exhibition and a recorded video; a museum exhibition and daily office affairs are “pitted against each other” to contrast fiction and reality. The administrator becomes a “virtual reality” that exemplifies the fine line between reality and fantasy. 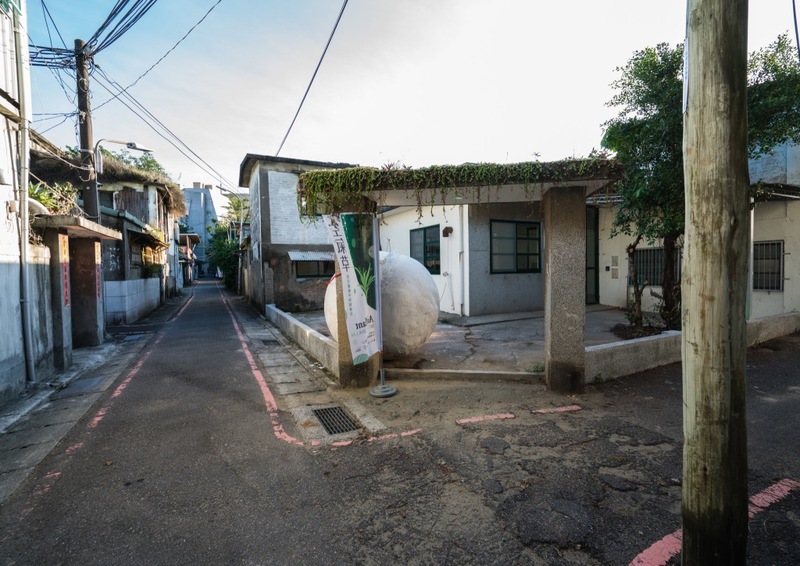 Audience entering the exhibition is unable to determine whether it has entered a real space or one that seems real, an idea that mirrors the existence of two moons in 1Q84, a novel written by Japanese writer Haruki Murakami. 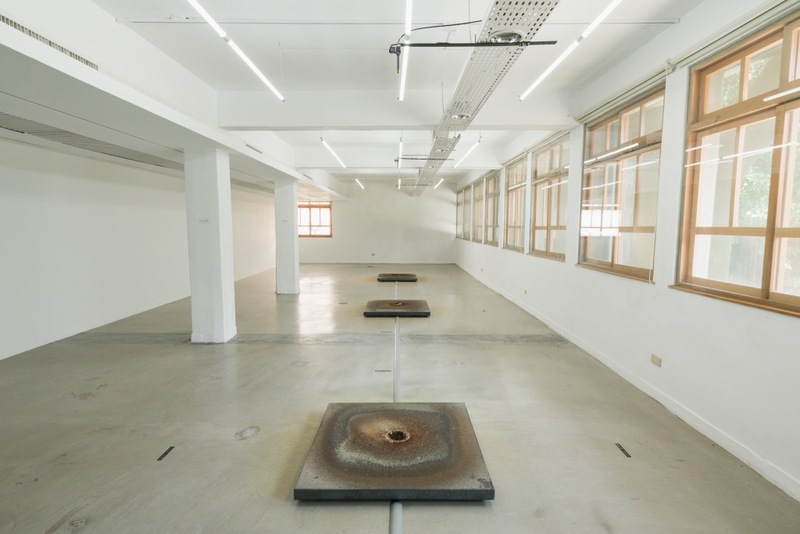 Yannick DAUBY, Trajectories & Impacts, 2012-2017, Sound installation. Free-flowing space invites audience to reflect on the notion of “self.” In Riverbed Theatre’s I Stand Naked in the Street with Sleeping Lions, three different deer “setups” (i.e., a drawing, a stage, and animal bones) are used. In the drawing, an entity with the body of a human and the head of a deer looking directly at the audience is seen; the entity also holds a gun and seemingly engages in a violent behavior. 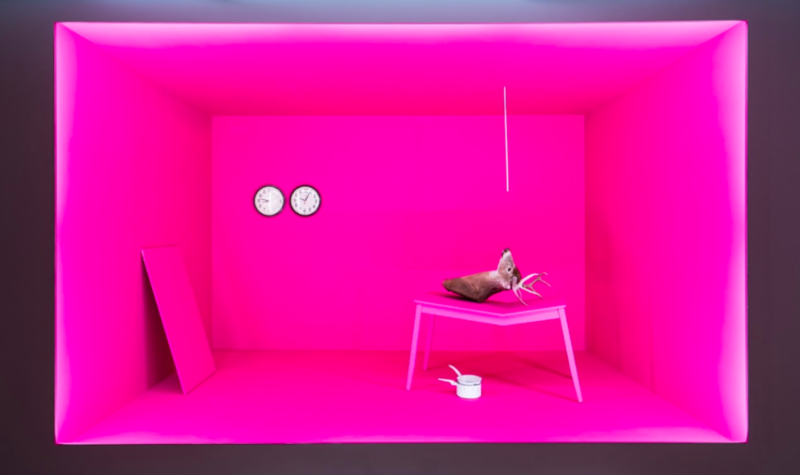 On the pink stage, a deer head specimen is placed on a table, where subtle swaying of items on the stage describes the interaction between fantasy and cruel reality. The responses of the audience outside of stage are their own perceptions. In front of a wall, suspended animal bones portray the possible remains of a body after life vanishes. The artwork presents dream-like images, whereas the audience references its life experiences to gain unique insights. In La Ribot’s Beware of Imitations!, a darkroom-like environment is used to have a conversation with Loie Fuller’s artwork. The video introduces two bodies, one of whom is Carles Santos playing the piano, and the other is La Ribot holding and hiding behind the camera. The former possesses a visible frame and controls the rhythms and sounds of the piano, whereas the latter is a virtually invisible being that serves as a projection of a spirit. By projecting itself into the images and sounds in the dark space using the camera, the audience penetrates Plato’s cave and into another dimension, where it is found along the boundary of visibility and invisibility. In Christian Rizzo’s Some Events Are Currently Ongoing, theater and style-centric imaginations convey various ideas, performance videos of varying sizes are projected on walls in the dark room, objects occupy space in a static or dynamic manner, smoke carries the meaning of reality and fantasy, and sounds are heard on a stage and in the exhibition site. These phenomena are all a part of the artist’s previous artistic endeavors. Audience walking through the artwork enters a fictional stage as well as the artist’s subconscious. Yung-Ta CHANG, Relative Perception N°4-C, 2017, mixed materials, dimensions variable. Static and dynamic objects, sounds, videos, space, and time are combined and stacked in the artwork, where the audience is provided an opportunity to watch, listen, feel, and perceive the content of the artwork to facilitate artwork–audience communication. The Air Plant exhibition pays attention to the art creation process, in which the goals are to harness art creation entities’ creative energies, encourage artists to self-speculate, facilitate audience participation, and awake the audience’s perceptions. Riverbed Theatre (Craig QUINTERO, Carl JOHNSON, Andrew KAUFMAN, Lee Emma RUNNING), I stand naked in the street with sleeping lions, 2013-2017, Mixed media (sculpture/fountain, painting, video, animal bones), dimensions variable. In the movie Interstellar, the lead actor falls into a multidimensional space from outer space, causing him to travel through space and time and enter a wormhole; there, he attempts to pass messages to the younger version of his daughter. According to the string theory, the wave-like properties of particles can alter dimensional configurations. In other words, spatiotemporal cracks exist in every corner of space. Therefore, to escape from the universe that we live in and travel through space and time, we need sufficient energies to open wormholes and connect black holes and white holes together. The same concept can be adopted in art practices to transcend the boundaries of performance and art creations, discover new possibilities in art activities, and venture into the unknown. In fact, the Air Plant exhibition possesses such energies. The Air Plant exhibition does not use the exhibition to promote new art events, but rather shows the micro-universe created by the artists. Each artist has his/her own domain formats, issues to be discussed, and creative trajectories. No efforts were made to deliberately connect the artworks together according to their styles, themes, images, or symbols; instead, each artwork is allowed to showcase its own philosophies and ideologies, forming a symbiotic performance-oriented ecosystem. 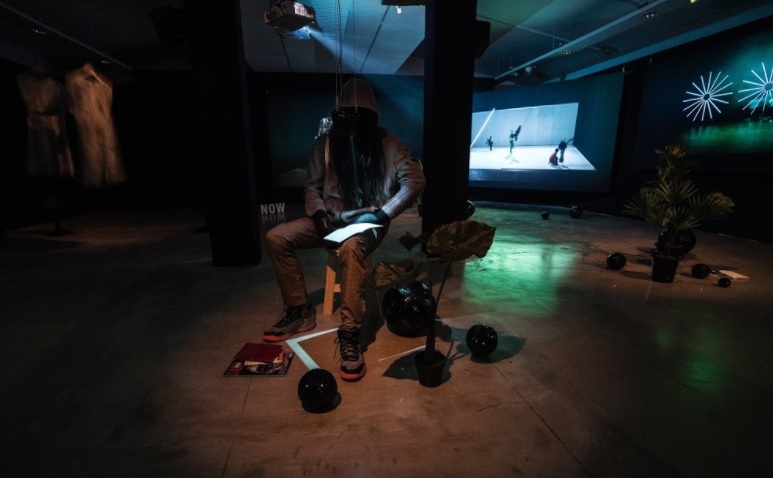 The Air Plant exhibition places a special emphasis on exploring individuals’ changing statuses, engaging in self-examinations while undergoing expansions, and inviting individuals to ponder over the issue of the performance ability within contemporary arts. Gu Cheng once said “When art becomes a flower, its fruit becomes a god and its leaf a philosophy.” What does the fruit and leaf become in the Air Plant exhibition? That remains to be seen. La Ribot, Beware of Imitations!, mixed media, video and installation, dimensions variable. Christian RIZZO, quelque chose suit son cours…, mixed media, video and installation, dimensions variabl. Hsiao-Chen Chiu graduated from the Institute of Art Media, University of Paris III: Sorbonne Nouvelle (UFR Arts & Médias, Université Sorbonne Nouvelle) and has a Ph.D. degree in Sociology of Arts and Culture (La sociologie des arts et de la culture). She specializes in writing, conducting art research, and interpreting exhibition concepts. Picture 1. Exterior view of The Northern Campus. Picture 2. Ying-Cheng Tsai (2017). No. 212. Garden pool, blue and white tiles, dimensions variable. Picture 3. Kuei-Chih Lee (2017). Recycling Scenery. Mixed media, spatial installation, dimensions variable. Picture 4. Shih-Chieh Lu (2017). Performer. Photography lens, LCD TV, dimensions variable (interactive installation). Picture 5. Fong-Fong’s Group (2017) (Xuan Huang, Jie-ching Shih, Min Yao, and Chen-yu Yu). Fong-Fong House, behavioral performance, dimensions variable. Picture 6. Wei-Chia Su (2017). FreeSteps – Sense of Place. 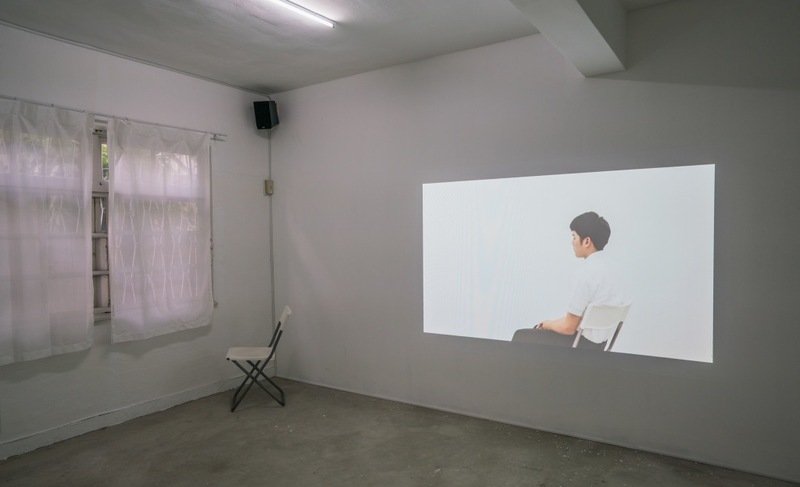 Video installation, dimensions variable (photograph provided by: Chun-Yi Chang; and sound provided by: Yannick Dauby). 1 Sarah Rose (2014). How England Stole the World’s Favorite Drink and Changed History (translated by Yi-Hsin Lu). Taipei, Rye Field Publishing Co., 2014. 2 Chun-Yi Chang (2017). Discussing the Planning of the Air Plant: Performance Ability within Contemporary Arts Exhibition.